Portugal is the country of breathtaking monuments. Portugal is a country of breathtaking monuments, such as Pena National Palace and Jerónimos Monastery. The Ria Formosa lagoon and Christ the King statue also provide wonderful opportunities for photos. Around 2.1 million British nationals visit Portugal every year, which can be accessed from the United Kingdom by airplane, car, train and ferry. Airplane is the quickest form of transportation, with a flight from London to Lisbon, the capital of Portugal, taking just under three hours on average. 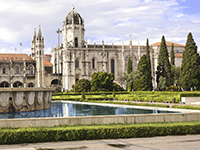 Taking this trip by train will require at least two days’ travel, driving will take around 21 hours, while the ferry can be travelled from Plymouth to Santander, however, additional arrangements will need to be in place to get you into Portugal. If you are unsure as how to manage your diabetes while travelling Portugal, you should discuss this in advance with your diabetes team. Portugal is one hour ahead of Greenwich Mean Time, which will not necessitate major changes to your diabetes management. Portugal has a very enjoyable climate, with warm winters and beautiful summers. Average summer temperatures reach around 25°C across most of the country. Regardless of what time of year visiting, travellers taking insulin should vigilantly monitor their blood sugar levels as insulin absorption can be enhanced in warmer temperatures. You could consider reducing your dosages if you are planning any physical activity and are worried about hypoglycemia. The currency in Portugal is the Euro, with exchange rates much better in the UK than in Portugal for those looking to exchange money. Most major debit and credit cards will be accepted in restaurants and supermarkets. There are no mandatory vaccinations required to enter Portugal, however rabies is present in bats in Portugal, so it is advised for those planning activities in remote areas that put them at risk for bat bites to receive a rabies vaccine. Portugal is amongst the European countries that allow you to receive state healthcare either at a reduced cost or sometimes for free when on a temporary stay. It will cover you for medical treatment until you return to the UK. Medication is available in Portugal, but payment is required from a pharmacy, for which the Portuguese translation is “Farmácia”. However, possessing an EHIC card allows you to receive treatment at a lesser cost and this money can be recouped when you get back into the UK. Blood and urine testing kits are available from any pharmacy in Portugal. If you are travelling with another person, the emergency services telephone number to be called in Portugal in the event of an emergency is 112. You should note which syringes are available in Portugal, with U-100 syringes the most commonly used. What language is spoken in Portugal? Portuguese, although many locals will have a basic grasp of English, especially those that work in a customer service environment.